Testing of the artillery gun back on track! Indian Army is going to resume trials of US-made M777 ultralight howitzer in the Pokhran firing range, Rajasthan. During the trails local ammunition will be used and tentatively 100 to 150 rounds will be fired. The trials will begin after they were suspended in September 2017 following a barrel burst caused by faulty ammunition during firing. M777 is a 155-mm, 39-calibre towed artillery gun. It is manufactured by US based BAE Systems’ Global Combat Systems division. It is smaller and lighter, as it is made of titanium and aluminium alloys and weighs just 4 tonnes. It has an effective firing range of 24 km. It can use all types of 155 mm ammunition. It can be easily transported by heavy lift helicopters, which will give Indian Army tremendous flexibility in its operations, especially in high altitude mountainous terrain. It takes only three minutes to come into action and has a pack-up time of just two minutes. It can sit down like scorpene, which makes it difficult to be spotted by the enemy tanks. 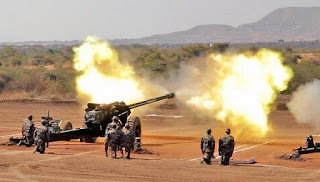 Induction of M777 Howitzer artillery guns is expected to add tremendous firepower and much needed operational advantage to the Indian Army as they will be deployed in high-altitude areas in Arunachal Pradesh and Ladakh, bordering China. It will also give access to state of the art technology. These artillery guns are already being used by US, Canadian and Australian armies. India signed a Letter of Agreement and Acceptance (LoA) with US Government in November 2016 to buy 145 M777s through the foreign military sale (FMS) route at cost of $737 million. Of the 145 guns, 25 will be imported while the remaining 120 will be assembled in India in partnership with the Mahindra group. Deliveries are slated to commence in March 2019 and will be completed by 2021. M777s deal is the first contract for artillery guns in almost 30 years after Bofors artillery guns induction in late-1980s, which had got embroiled in political controversy due to illegal kickbacks. Bofors guns however had been mainstay for Indian Army for decades and had played important role in Kargil conflict.